I really enjoyed last week's senses post.....so here's another! Making: Soup. Always making soup......that's what winter is for, right? this is an adaption of this soup that I raved about last week. 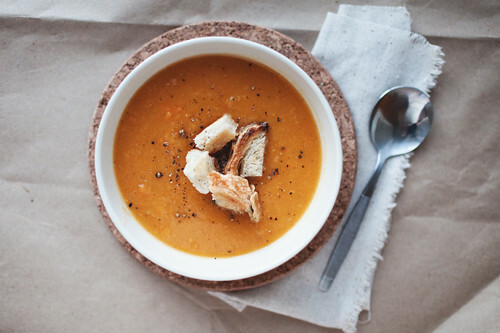 The best part about this soup is that you can add a combination of whatever winter root veggies you have on hand--carrots, different kinds of potatoes, parsnips, winter squashes....anything! Halve your veggies and brush with olive oil and sprinkle with salt and pepper. Roast all veggies on a baking sheet at 400°, until fork tender (around 45 minutes, depending on the size of your veggies.) I took the onions and garlic out sooner--keep an eye on them since they're smaller. After the vegetables are roasted, add them to a food processor or blender, and add 2-3 cups of chicken stock, enough so you can easily puree. Let soup simmer in pot for at least 30 minutes, so flavors can come together. We topped ours with toasted bread and had a simple salad of mixed greens, marinated roasted peppers, goat cheese, a squeeze of lemon, and olive oil. Seeing: Sunshine, and snow, and snow and sunshine. This weather is weird. Hearing: I was up late working until the wee hours of the morning last night and listened to Jimmy Eat World's Clarity, Bleed American, and a little from Futures. It was awesome, and nostalgic, and awesomely nostalgic. Smelling: Whitney's fabulous cooking each week when we shoot for the cookbook.....yum. Tasting: Goat cheese. I have always loved it, but the past few weeks I have become a bit obsessed....it has such a bright flavor, and it's perfect for sandwiches and salads during these winter months when there's not a lot of fresh flavorful produce. Feeling: warm. Flannel pajama pants are the best invention ever. Reading: Dr. Suess's Mr. Brown Can Moo! Can You? to the boy's class today. ...seriously why does the shortest month take the longest? this soup looks delish! i love all your soup recipes actually and try them often! i, too, am a huge fan of soup- year round, but especially in the winter! can't wait to try this one! my sweet little girl loves jimmy eat world and i think its because we went to their show when i was pregnant. i so love them, also good slow paced running music. the weather here in co has been a little nuts lately too, but we are dealing with it, enjoying our sunny days! Aww, you're reading to your boy's classroom today?! The weather is crazy here too. It's actually warm outside! Above 50! We have windows open! seeing: can't see across the street as it's snowing so hard! Hoping: spring will come soon! Breathing: the smell of my new baby boy. Intoxicating. Trying: to make new soup recipes, thanks! Stunning soup...looking so inviting and vibrant. I will love to give this soup a try asap !